OK, now that the regular season is over, and the playoffs have yet to begin, let’s take a look back at the 2010 Yankees and see where they stand as a team and compare them to last season. Taking a quick look at the Yankees lineup collectively—the Yankees’ everyday player roster was the 3rd oldest in the AL. Collectively, they led the AL in runs and had the highest OBP and tied with the Red Sox for the highest OPS+. However, their batting average dropped from 2009’s .283 to .267 this year. They had 244 HRs last year compared to 201 this year. As for their pitching staff, they were the oldest in the AL with an average age of 30.4, as compared to 2009’s 29.3. They gave up a below AL average 4.28 runs a game. They were, however, the second worst in giving up homers with 179 this season. In most pitching stats, the Yankees were close to AL average, including ERA, SO/BB and team WHIP. The 2009 Yankees had a team WHIP of 1.352 as compared to this season’s 1.310. Last year’s squad led the AL in K’s with 1260. This year’s squad dropped to 1154. The Yankee pitching staff collectively had an ERA this season of 4.06, as opposed to last year’s staff’s ERA of 4.26. Individually, there were a lot of fluctuations. From last year to this. Last year, Mariano Rivera had 44 saves as opposed to this year’s 33, though his ERA is nearly identical to last year’s; 2009’s 1.76 compared to this year’s 1.80. One foreboding stat was that in 2009, Rivera had an average of 9.8 SO/9. This year that number dropped precipitously to 6.8 SO/9. On the other end of the spectrum, Javier Vasquez’s ERA jumped from 2009’s 2.87 with the Braves to 5.32 with the Yankees. His 32 HRs surrendered was 3rd worst in the majors. A.J. Burnett was almost as disappointing. He saw his ERA jump over a point to 5.26. 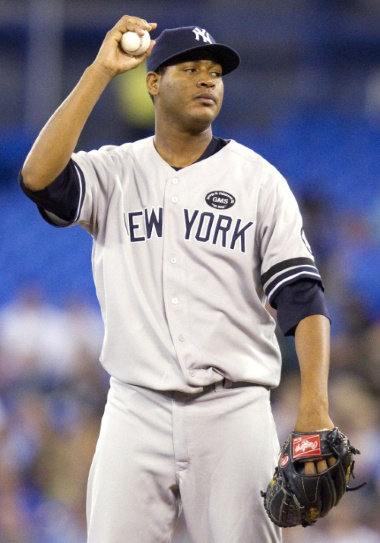 His 109 earned runs surrendered was good enough to tie for 3rd worst in the majors. He led both leagues with 19 hit batsmen. Burnett’s 145 strikeouts dropped 50 Ks from last season. Andy Pettitte had a great year, and improved in almost all statistics, though he was injured for a portion of the season. Phil Hughes had a nice 1st season as a permanent part of the rotation, and while he flagged a bit in the summer, he had a 3.45 ERA in his last 5 appearances. Last year’s relievers combined for a 3.91 ERA, though a large part of that could be chalked up to a terrible early start to the season before Girardi set up his permanent bullpen. They had a collective 1.249 WHIP and had a 8.4 SO/9. This year’s model had a 3.47 ERA, a comparable 1.255 WHIP, but dropped to a 7.7 SO/9. On the hitting side, the Yankees had a number of players whose batting average dropped significantly from 2009, including Derek Jeter (.334 to .270), Mark Teixeira (.290 to .256) and Jorge Posada (.285 to .246). The Yankees also essentially traded Melky Cabrera’s .274 BA for Curtis Granderson’s .247—though Granderson did have a higher slugging percentage than Cabrera’s .468 to .416. On the plus side, Nick Swisher’s average rose from .249 to .288 and Brett Gardner’s OPS+ jumped from 93 to 106. His OBP was good for 8th in the AL. He also was 2nd in the AL in assists from LF. Gardner led the Yankees with a .383 OBP (up from .345 in 2009) and Robinson Cano led them with a 142 OPS+ (up from 129 last season). Cano tied for 9th in the majors with a 6.1 WAR, was 5th in the AL with a .319 BA and had 200 hits, good for 2nd in the AL. Cano also had 334 total bases, just 17 behind the leader. Alex Rodriguez’s 125 RBIs was good for second in the majors despite only playing in 137 games. Teixeira’s 113 runs scored was also good for second. Teixeira also had 93 walks, good for 5th in the majors. Brett Gardner was 4th in the majors with 47 stolen bases. 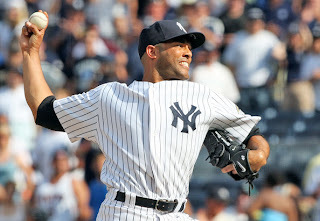 On the down side, Derek Jeter was 9th in the majors with 22 GIDP and was tied for 1st with 515 outs made. Curtis Granderson, despite extensive time with hitting coach Kevin Long ended up with essentially the same batting average as last year—.247. Despite a small surge after Long changed his approach, Granderson regressed and batted .212 in the last 2 weeks. In almost every team statistic, the 2010 Yankees didn’t equal their numbers from 2009. Interestingly, a number of Yankees dropped significantly in the BABIP department. Alex Rodriguez dropped from .303 last year to .274 this season. Teixeira (.302 to .268), Jeter (.368 to .307) and Posada (.328 to .287) all also declined significantly. In fact, were it not for Brett Gardner (who led the Yankees with a .340 BABIP) and Nick Swisher’s extraordinary improvements, the team BABIP, which dropped only from .306 to .300 would have been far worse. What can’t be mistaken though, is the core of the Yankees lineup dropped, and dropped considerably, almost to a man. The Yankees struck out more than they did last year: 15.7% last year as compared to 17.8% this season. Also, they dropped in line drive % and in HR/FB percentage. And the Yankees as a team swung at almost 4% more pitches out of the strike zone than they did last year—which is a significant increase. What this tells us that the Yankees are swinging at more pitchers’ pitches. And when they do hit the pitch, which is less than last year—they aren’t getting the good wood of the bat on the ball, resulting in easy fly balls, less line drives and easier outs overall. What does this all mean for the playoffs? Ultimately, who knows? However, with these stats, were I manager of the Yankees, I would move Gardner to the top spot, and move Jeter down in the lineup. Also, Javier Vasquez would be off the playoff roster, Ivan Nova would be on, Burnett would be a reliever, and I would move Hughes to the 2nd spot in the playoff rotation as he is over a point better ERA-wise on the road rather than at home. Again, I doubt Girardi will do that; he is fiercely loyal to his veterans, and wouldn’t want to possibly insult Pettitte and Jeter by pushing them behind younger players. And maybe he’s right—who knows? One thing for sure: whereas the Yankees were confident going into the playoffs last year that they would be the Twins handedly—that isn’t the case this year. They look old - but I've thought this in other seasons and they have managed to surprise me. Just watched the Yankees win and I'm shocked that any hits left the ballpark. Jeter, Posada, and Rivera all helped seal the win. I am pleasantly surprised.